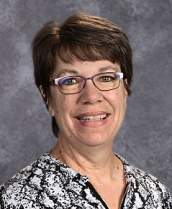 Karen Kolar of Westbrook-Walnut Grove is this year's Office Professional of the Year. Karen is the senior member of her building and is respected not only for her length of service, but her work ethic and the ability to think on her feet. Staff members praise her commitment and her dedication and share she seems to be everywhere from 7:00 in the morning working with the bus drivers until early evening with community connections. Karen is often referred to as the "Office Goddess" because of her ability to perform "vast amounts of miracles" from her cubical. Karen's commitment reaches outside the school walls where she is a longtime member of the Westbrook Area Volunteers. She is the group's secretary and has committed countless hours to projects like repainting dugouts in the community park and planning the "Polar Express Night" for youth at Christmas. Staff point out Karen's major talent is dealing with troubled kids. "She has a genuine affection for students, especially troubled ones and she becomes their cheerleader and helps them overcome obstacles in their path". Return completed application form to the MASSP office on or before November 16.